My grandpa loves westerns. Growing up, when I would visit my grandparents, I would lay in front of the TV for hours watching old westerns like Gunsmoke, Bonanza and Wild, Wild West. I have fond memories of these times with my grandpa and these old shows. A hallmark of these shows is the barfight. Seriously, you can’t go longer than 3 episodes without someone cheating at cards, someone feuding over water rights or someone bumping into the angry cowpoke who just wants to drink, watch prostitutes micturate on a bed and fight (not necessarily in that order). The ensuing fight usually includes flying haymakers, smashing bottles, upended spittoons and numerous people crashing though tables. I loved these fights. My cousin and I would reenact them, smashing empty liter bottles over our heads and throwing each other through tables made of cardboard boxes. Fast forward a few years and my latent fascination with barfights resurfaced when I saw one of the greatest movies ever made. A movie whose entire plot focuses on the physical action of barfights, the politics of barfights and the love interests resulting from barfights. I’m talking of course about, ‘Roadhouse’….you’re picturing roundhouse kicks and monster trucks right now, aren’t you? Yeah, you are. Awesome. ‘Roadhouse’ became somewhat of an obsession for me. I had a Double Deuce replica bouncer uniform, a Dalton haircut and the single of ‘Cliff’s Edge’. What? You don’t know, ‘Cliff’s Edge’? Pffft, it’s the song Patrick Swazye wrote and sang for the soundtrack. It's brilliant. In addition, I even wrote a paper for my Popular Media class positing that “Roadhouse” was a modern allegory for the class struggle of labor vs capital. It was the research for this paper that connected with me Mike ‘Slivers’ McCombs. Slivers was an uncredited stuntman on ‘Roadhouse’ who got his nickname from getting 27 slivers embedded in his forehead after having a chair busted over his head while in the Marines. Slivers would never comment on why he wasn’t credited for his work on the film, and he said he never worked on another movie again after. During one of our chats about his time on set, Slivers revealed he was a Packers fan. We quickly bonded, and it led to a couple conversations a year about the how each season was going. I hadn’t heard from Slivers in a few years, but I got an email on Monday after the win against the Giants. The subject just said, ‘It can’t be done’. Intrigued, I opened the note. “Frank, long time no talk. How are things? Good here, just planned the stunts for my granddaughter’s school play. Pretty kickass. She fights off 15 ninjas and a ship full of pirates. Well, if I hadn’t seen it myself, I wouldn’t believe it. Sam Elliot and his beautiful, long, grey locks Ran the Table to the tune of nine. Elliot ended up in the hospital for two weeks, and I got fired, but it was worth it to witness. To this day, no one has ever beaten Elliot’s nine tables ran. So you see, Frank, that’s why Rodgers and the Pack can’t do it. No one can run ten. It just can’t be done. Sorry to be the bearer of bad news. Take care of yourself, brother. I was dumbfounded. Two things I realized: 1) Sam Elliot is even more of a badass than previously believed 2) When someone loses faith, you gotta reassure them. “Slivers, great to hear from you. That’s a helluva story. I love Sam Elliot with the fire of a thousand suns. One more thing: Trust in Rodgers. They’re gonna do it. They’re going to run the table and go for ten. 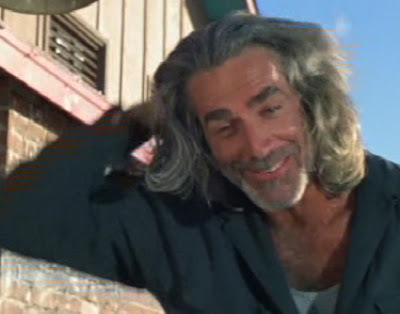 Wasn't Sam Elliot part of the last Packers' SB intro? It's a sign!